Generic (International Nonproprietary Name): Aspirin + Paracetamol + Caffeine. Pharmacological group: Non-narcotic analgesic (non-steroidal anti-inflammatory + non-narcotic analgesic means + psychostimulant). Active substances: Acetylsalicylic acid - 0,2 g; Paracetamol- 0,2g; caffeine- 0,037 g.
Aiding substances: Citric acid; starch, talc, lactose, polyvinylpyrrolidone, calcium stearate. Pharmacological operation: Ascophenum is a combined preparation which pharmacological operation is conditioned by the compounding components. Acetylsalicylic acid and paracetamol inhibits the synthesis of prostaglandins, thereby identifies an analgesic, antiinflammatory and antipyretic action. Caffeine stimulates the respiratory and vasomotor centers, dilates blood vessels in head brain, also enhances the effect of aspirin and paracetamol. · Algodismenorey, and rheumatic illnesses with fever current and cold. Administration and dosage rule: 1 tablet 2-3 times a day. Contra-indication: High sensitivity towards preparation components, Stomach and duodenum ulcerative diseases in an aggravation phase, bleeding from intestine (including in the anamnesis), hemorrhagic diathesis, pregnancy and lactation period. Side effects: Nausea, heartburn, pain in epigastric areas, bleeding, allergic reactions. Over dosage: In case of overdosage gastric lavage and taking of activated coal is necessary. Caution: It is not recommended to combine a preparation with barbiturate, salicyl, anti cramp means, rifampicin and alcohol. During treatment period it is necessary to stop breast feeding. Interaction with other medical preparations: Strengthens effect of antiaggregants and anticoagulants, increases risk of development of side-effects against the background of glucocorticoid and preparations sulfanil- urea preparations. Pregnancy and lactation period: Usage of preparation is counter-indicated during the period of pregnancy and lactation. Influence on ability of management of motor transport and mechanisms: The preparation does not influence on ability of driving and work with techniques. In case of detection of defects at visual survey, preparation taking is forbidden! Issue: Pharmaceutical production group III - issued without doctor’s prescription. 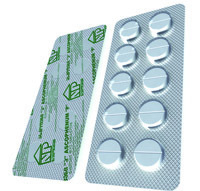 Production form: 10 tablets in pvc/alu blister. Storage conditions: Store at a room temperature, dry place.